Quechua, the language of the Inca Empire and still spoken by approximately 8 million people throughout the Andes, is the most spoken indigenous language in the Americas. Quechua varieties are spoken in Colombia (where the language is called Inga), Ecuador (where it is called kichwa or runa shimi), Peru, Bolivia, and Argentina (where it is usually spelled Quechua and called, by its speakers, runa simi). Quechua speakers not only live in South America: many of them have migrated to Spain, Italy, and the United States (mostly in the Miami Metro Area, New Jersey and the New York City Area). Increasing numbers of Quechua/Kichwa speakers are moving to the Philadelphia Metro Area. As NYU Prof. Odi Gonzales points out “Quechua has gained greater force in recent years, during which indigenous movements have swept Quechua speakers into national politics, where they have succeeded in transforming constitutions to recognize cultural diversity in Colombia, Ecuador, Peru, and Bolivia, making Quechua into an official language of state and successfully promoting schooling in the language". One example of this important momentum is the 2015 adoption of Indigenous Andean principles in Quechua, by the United Nations General Assembly: The principles of Ama Sua (“you shall not steal”), Ama llulla (“you shall not lie”) and Ama Quella (“you shall not be lazy”) were distinguished by the international body. 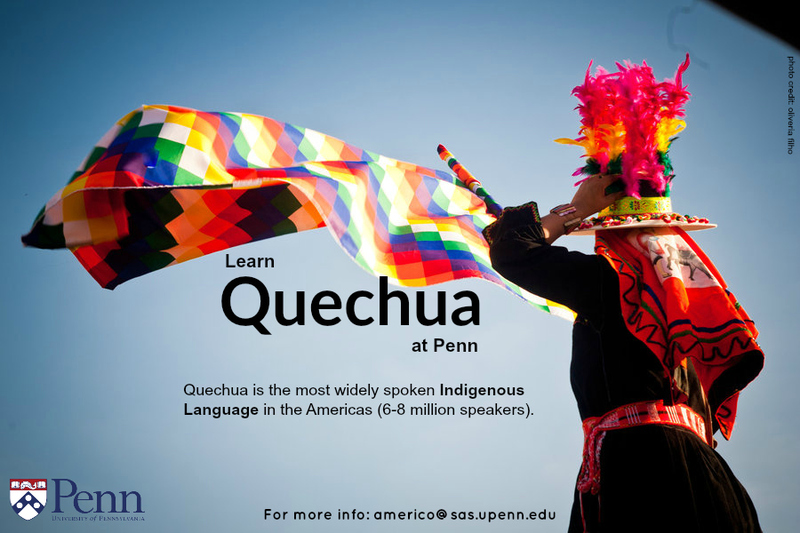 Please visit Penn's Quechua program website for more information.